Photo: Everything about the park is enormous. Leopards, elephants and rare birds roam the mist-shrouded mountains of Kaeng Krachan, the largest national park in Thailand. Few if any of the kingdom’s natural destinations match this one for jungle and wildlife, but it does take some effort to explore. Established in 1981, Kaeng Krachan National Park contains 2,915-square kilometres of mostly old-growth forest stretching along the eastern slope of the Tenassarim Mountain Range, only 170 kilometres southwest of Bangkok. The wilds continue undisturbed into the Tanintharyi Nature Reserve to the west of the Burma border and Mae Nam Phachi Wildlife Sanctuary in Thailand. Minimal human encroachment, high rainfall levels and several streams that feed into the Phetchaburi and Pranburi rivers result in exceptionally lush jungle. The park’s location at the “junction” of continental Southeast Asia and the Malayan Peninsula means northern deciduous forest meets the tropical evergreen jungle typical of the Malayan/Sumatran region, creating a haven for many species. Wild elephant sightings are common and you have better chances of spotting a clouded leopard here than just about anywhere else in the region. Endangered mammals in the park include Indochinese tiger, Malayan tapir and Fea’s barking deer. Birdwatchers look for some 460 species including the white-fronted scops owl, ratchet-tailed treepie and banded kingfisher. The name Kaeng Krachan comes from a large reservoir stretching to a dam and park headquarters on the park’s eastern rim. Park-run campgrounds and private resorts are available in this scenic area, though wildlife spotters should head deeper into the park and camp at Ban Krang or near the 1,207-metre peak of Khao Phanoen Thung. Quite a few Thai travellers flock up here at dawn to watch sheets of fog drape over the valleys. The only humans to permanently inhabit the park are Karen and Kariang people who have struggled to stay put in their ancestral home. In 2016, Thai judges controversially ruled that park officials had done nothing wrong when, five years earlier, they torched a village where a small number of Karen appeared to be living in harmony with nature. Among the shocked members of this mountain tribe, labeled “encroachers” by Thai authorities, was a 105-year-old man who was born in the forest long before it became a national park. Kaeng Krachan is a challenge to explore independently—do come prepared. Start with the sections below and then take a look at the travel page to review different ways of getting around. Kaeng Krachan National Park covers almost the entire western half of Phetchaburi province and a northern slice of Prachuap Khiri Khan province in west-central Thailand. Park Headquarters and the main Visitor Centre are found just south of the town of Baan Kaeng Krachan and 50 kilometres west of Cha-am, 60 kilometres southwest of Phetchaburi town and 70 kilometres northwest of Hua Hin. Along with Bangkok, these are the main starting points for hitting the park. It’s helpful to think of the park as having three distinct sections: Park Headquarters is helpful and the reservoir scenic, while Pala-U provides a splash of nature as a side trip from Hua Hin. But the park’s central road to Ban Krang and Phanoen Thung is the key part of Kaeng Krachan that you really should not miss. The park has no roads apart from those accessing these spots and one more in the north running to the remote Karen village of Pong Luek. The park’s main Visitor Centre stands beside a park-run campground and restaurant alongside the reservoir. Park officials who speak some English can help you arrange transport to Ban Krang and Phanoen Thung along with boat trips, and an ATM is found nearby. Also in Baan Kaeng Krachan, a few kilometres north of Headquarters, you’ll find a few banks, a public health clinic, police station and several Thai-style resorts and restaurants, plus Kaeng Krachan Dam. 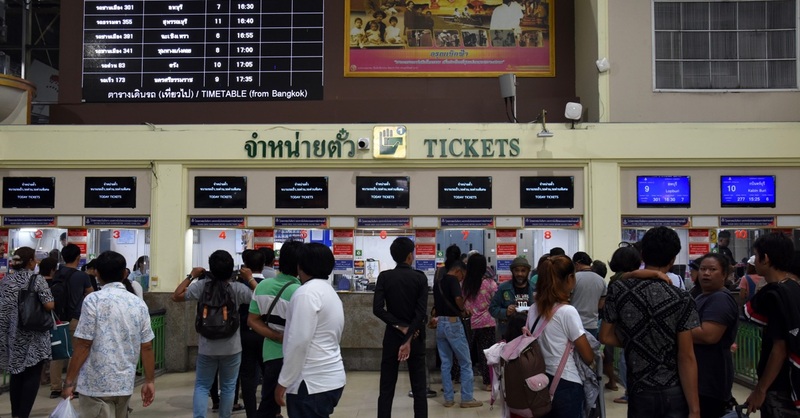 From the Visitor Centre it’s 20 kilometres south to the ticket gate at Sam Yod, 35 kilometres to Ban Krang Camp, 50 kilometres to Phanoen Thung Camp, and more than 70 kilometres down to Pala-U Waterfall. The whole area is fairly well signposted in English. Beginning at the Sam Yod checkpoint, a sealed road cuts west into the main central part of the park near the Pranburi River. Regular cars (note: not motorbikes) can drive on it for the first 15 kilometres to Ban Krang Camp, where you’ll find a smaller Visitor Centre, restaurant, campground and a couple of nature trails. This is a terrific area for birdwatching. West of Ban Krang, only four-wheel-drive vehicles with sufficient clearance are allowed on the steep 15-kilometre dirt road to Phanoen Thung Camp, where the road continues for six more kilometres before ending at the trailhead for Thor Thip Waterfall. In the cooler air of Phanoen Thung you’ll find another campground to go with a glorious viewpoint. This upper road is so rough that two-way traffic is not allowed. Vehicles can head west from Ban Krang only from 05:30 to 07:30 and 13:00 to 15:00. In the opposite direction, you can leave to drive down the mountain from Phanoen Thung only from 09:00 to 10:00 and 16:00 to 17:00. Expect to be fined and banned if caught driving in the wrong direction. Park rangers live and work at Ban Krang and Phanoen Thung; a few of them speak English but many do not. Down in the park’s far southern reaches, this series of small waterfalls is usually hit as a day trip from Hua Hin. It feels like a different national park, with a well-marked trail, a touristy vibe and a separate ticket gate and Visitor Centre. You’ll also find some park-run bungalows, a campground and restaurant, though few travellers overnight here and many skip Pala-U altogether. Entry to the park costs 300 baht for foreign adults and 200 baht for children, and there’s an additional 30-baht charge to bring a car or truck inside. All types of motorbikes and bicycles are not allowed in the park. While you can stay in the park for as long as you like on a single ticket, you will most likely be charged twice if departing one day and re-entering the next. You do not need a ticket to hit the reservoir and Headquarters. The gate to the main central section (Ban Krang and Phanoen Thung) opens from 05:00 to 17:00 and visitors must leave before 19:00. The gate to Pala-U Waterfall opens from 08:30 to 16:30. Excluding Pala-U Waterfall, the park closes from August 1 to November 1 for the worst of the rainy season. While it’s necessary to bring a local guide or ranger on most of the trails, walking along the 36-kilometre road from Sam Yod to Ban Krang and up to Phanoen Thung is doable on your own. Mosquito repellent (malaria and dengue are concerns) and leech socks are crucial, and bring a lighter or matches to burn off the leeches. If driving, never honk or flash lights at an elephant. Rangers can help you with minor cuts and bruises, but more serious injuries will require a trip to one of the hospitals in Phetchaburi or Hua Hin. All Thai provider cell phones should work in the vicinity of the Visitor Centre and Baan Kaeng Krachan, but only AIS phones work at Ban Krang and Phanoen Thung. There’s no cell service elsewhere in the park at all. WiFi is free at Park Headquarters and at most private resorts. From December to February the air is cool and dry, but this is also the busiest time. Migratory birds arrive in the hot months of March and April and a guide told us that the “sea of fog” seen from Khao Phanoen Thung was particularly stunning in April. If you don’t mind rain and leeches, wildlife (especially snakes) is very active during the wet months from May to July. We don’t suggest hitting Kaeng Krachan as a day trip unless you only want a taste of the jungle. A two-day visit would be sufficient to hit the Khao Phanoen Thung viewpoints and do a hike or two, but three days is ideal if you also want to enjoy the reservoir. With four days you could throw in a side trip to Pala-U Waterfall or the Karen community at Pong Luek.  Please sign up as a Travelfish member to download the Kaeng Krachan National Park guide PDF (7 MB, 31 pages). Membership costs just A$35 per year (less than A$1 per week) and gives you access to over 250 PDF guides. Last updated on 20th July, 2017. Browse our independent reviews of places to stay in and around Kaeng Krachan National Park. Read up on where to eat on Kaeng Krachan National Park. Check out our listings of things to do in and around Kaeng Krachan National Park. Read up on how to get to Kaeng Krachan National Park, or book your transport online with 12Go Asia. Planning on riding a scooter in Kaeng Krachan National Park? Please read this. 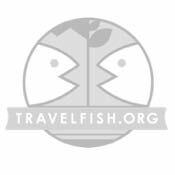 Use the above map to find specific destinations in and around Kaeng Krachan National Park which are listed on Travelfish. Bed icons indicate a guesthouse, hostel or hotel, the knife and fork is an eatery or bar and the four-way circular thingy marks sights, attractions and other points of interest. Click on any icon for a short pop-up and a direct link to the page for that spot. If you are in the area, use the teardrop icon near the top left to show your position on the map (you'll need to allow position sharing for this last feature to work).